"Renua was branded as 'Fine Gael Lite' - we are a centralist party"
Lucinda Creighton has stepped down as the party leader. What’s next for the party? Former leader of Renua, Lucinda Creighton. LAST YEAR, A shiny new political party was launched, promising new politics and a change in governance. Renua Ireland had a former Fine Gael TD Lucinda Creighton leading the party, and financial advisor Eddie Hobbs as party president. The party was off to a good start, with Creighton joined by two fellow ex-Fine Gaelers Terence Flanagan and Billy Timmins. Senators Paul Bradford and Mary-Ann O’Brien, an independent who was appointed to the Seanad by the Taoiseach in 2011 also signed up. However, fast-forward 18 months and the party underwent a crushing defeat in the general election. Yesterday, Creighton stepped down as party leader. Renua councillor John Leahy told TheJournal.ie the party needed to take stock. He said Renua also needed to take responsibility for the election result. The party was branded as “Fine Gael Lite” – something that didn’t resonate with the party members, he said. The councillor said the party was branded as being extreme right, and that needed to be corrected. We are very much a centralist party. The Offaly councillor, who has been tipped to take over the leadership, said he would be up for the challenge, but that he thought the leadership contest should be opened up to members of the Oireachtas or anyone else. “If other people are interested in joining the party, why wouldn’t we open it up to them?” he said. Leahy said the incoming leader would have a very different role to Creighton’s. Lucinda set up a party right in the middle of an election campaign. Now we have time on our side. We can travel around the different regions and get new members. It will be a different body of work. The leadership is going to be a different role. He said the next leader would have to be someone willing to give it 100%. Leahy said the party had a lot of work to do, and it would start with their “root and branch” review. Councillor Patrick McKee said there were “varying political outlooks” expressed at the meeting over the weekend, but that there was “no agreement” on what one the party should take. He said that a lot of people had put in “sweat, tears and money” into the party, and many members believed the next leader should be from the grassroots and within the party. Creighton’s resignation yesterday was not surprising as Renua failed to win a single seat in the 32nd Dáil, with Creighton losing her own mandate in Dublin Bay South. Renua had hoped to win 10 seats, running 26 candidates in the 40 Dáil constituencies. However, on count day, the political casualties mounted. Longstanding politicians Billy Timmons and Terence Flanagan were denied a seat. Timmons lost his seat in Wicklow, which has been in the family since 1969 bar a hiatus between 1987 and 1989. He has since stepped away from the party. The risks of hitching your wagon to a new political party was something Creighton nodded to in her speech yesterday at the national members’ meeting in Portlaoise. Billy Timmins, Terence Flanagan, Paul Bradford all took huge political risks not because Fine Gael would not welcome them back, not because they believed being part of a new party meant the likelihood of being returned to the Dáil would be greater.They took these political risks because they believed in what Renua Ireland was trying to do. Creighton said she was surprised with the results, particularly when it came to Cllr John Leahy, who she described as “a dead cert for election”. I was even reliably informed that Brian Cowen had even tipped him to take office. Creighton, who has been the face most associated with the party since its inception, said she did not imagine she would be departing the political stage this early. Creighton pointed out over the weekend that her departure does not mark the end of the party. It’s time for me to move on from leading Renua Ireland and allow new voices to be heard. I leave my role as party leader perhaps more humbled, but no less proud of all that we have achieved together and what can be accomplished in the future. 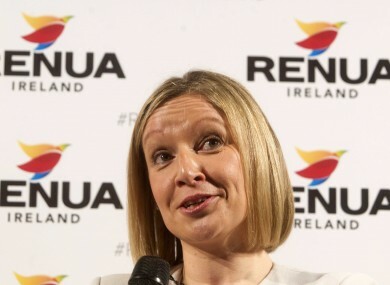 So, what next for Renua Ireland? Speaking to TheJournal.ie, party secretary Mary Kennedy said yesterday’s national members’ meeting in Portlaoise was successful. Since the general election, the party has been carrying out an internal review, which involves holding discussions with all 26 candidates that ran for election, as well as holding five regional management meetings. “There are a lot of people still very much interested in the party… there is no question, the party isn’t going anywhere,” she said. Kennedy said the party has a future ahead of it. Email “"Renua was branded as 'Fine Gael Lite' - we are a centralist party"”. Feedback on “"Renua was branded as 'Fine Gael Lite' - we are a centralist party"”.